In the past 30 years, optical fibers with diameters larger than the wavelength of guided light have found wide applications including optical communication, sensing, power delivery and nonlinear optics[1-6]. For example, by transmission of light through total internal reflection in optical fibers, the power of light has been sent to travel across the sea for telecommunications [ 1,2], to creep into buildings for safety monitoring[3,4], to puncture tissues for laser surgery  as well as many other applications ranging from illumination and imaging to astronomical research [7,8]. Recent advances in nanotechnology and the increasing demand for faster response, smaller footprint, higher sensitivity and lower power consumption have, however, spurred efforts for the miniaturization of optical fibers and fiber-optic devices[8-10]. 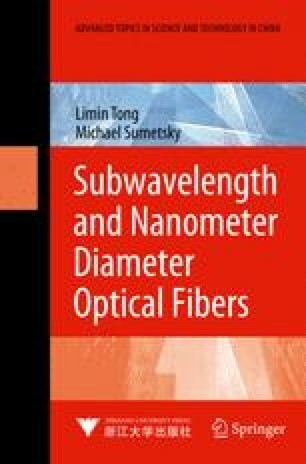 Therefore, an important motivation for fabricating subwavelength-diameter optical fibers is their potential usefulness as building blocks in future micro- or nanometer-scale photonic components or devices and as tools for mesoscopic optics research. Also, it is always interesting to guide light and watch how it works on those scales that have not been tried yet.